What if Anthony Bourdain killed himself because he loved life too much? Bourdain was a man who worked more than 200 days a year on the road. He visited the most incredible locations on the planet, dined in the most celebrated restaurants, drank the world’s most distinguished bourbons, caroused with celebrities, and pushed the limits of adventure, ecstasy, and craftsmanship beyond their breaking points. Perhaps Anthony Bourdain was so in love with his life that he became contented with the dampening veracity that there is no peak experience greater than the last. Bourdain was a lot of things, but clinically depressed was not one of them. He was human. He was harsh. He was offensive. He was arrogant. He was liberal. He was so damn smart. He was believable. He was trustworthy. He was sympathetic. He was an addict. He was redeemed. As someone who became famous at the age of 44, he was not afraid of failure. Above all else, he was an American original. Only America could have produced an Anthony Bourdain. And like America, he was a bouquet of paradoxes-all of which made him wonderfully flawed and curiously relatable. For one, he reported stories that almost no other mainstream news outlet wanted to cover, yet he ultimately went to work for CNN, the most mainstream news network in the world. As a journalist and chef he was open to almost any cultural experience, but he rejected vegetarianism and veganism as first world luxuries. He could be open minded and passionately tolerant and also condescending and disparaging toward particular groups and individuals. 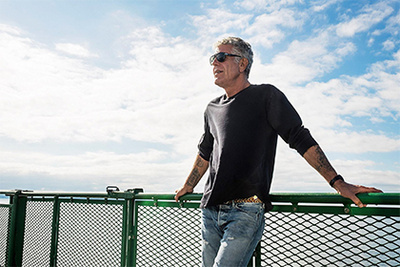 Bourdain was intoxicated by food, dance, history, family, language, and the rituals of life. He was also morbid, cynical, and sometimes misanthropic. Fascinated by war and social breakdown, he often gravitated in his voyages toward the lure of violence and death. And lest we forget, he was a devoted father of an 11 year old daughter and madly in love with his wife Asia Argento. In the end, he seemed to be doomed more by the fragile forces of tenderness than the dark energies of anguish and cruelty. George Cassidy Payne is an independent writer. He lives and works in Rochester, NY.